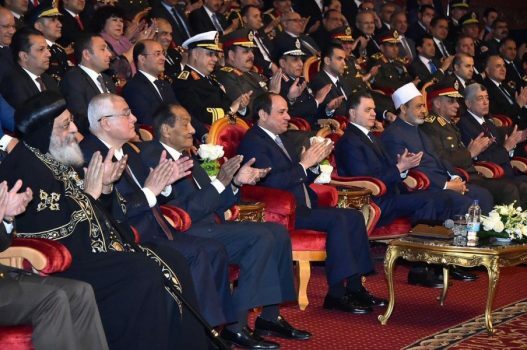 Coptic Orthodox Pope Tawadros II (far left) attends a Police Day celebration with members of the Egyptian security establishment (photo via the Coptic spokesman's Facebook page). The committee will comprise members of the Armed Forces, military intelligence, general intelligence, the Administrative Control Authority and the National Security Agency. The committee will be chaired by the president’s advisor on security and anti-terrorism affairs [currently former minister of interior, Magdy Abdel Ghaffar]. The committee is missing a number of relevant parties necessary to address interreligious violence. There are no representatives of the judiciary or legislature who could help inform a conversation on what legal reforms could help mitigate sectarianism. Experts on human and civil rights, even from the state-backed National Council on Human Rights, are excluded. While the state claims to be addressing sectarianism, the committee can at best be described as targeting sectarian terrorism. While the state is not directly responsible for most of the violence that has been perpetrated against Copts and other religious minorities, it has acted in ways that fuel religious divides among its citizens and have created a permissive environment for many forms of sectarian attacks provided they don’t reach the level of terrorism. One example of state sectarianism is the “customary reconciliation sessions” that have long been preferred by interior ministry officials in resolving sectarian disputes. During these sessions, community and religious leaders gather with state officials including local security officials to find a ‘resolution’ following a sectarian incident. The Egyptian Initiative for Personal Rights, a prominent local rights group, in a report found that these sessions “tend to favor the stronger party at the expense of the weaker one, i.e. the Christian party in most instances. State authorities often exert pressure on the weaker side to accept to take part in customary sessions and bypass regular judicial mechanisms.” State officials, including officials from the bodies that form the new anti-sectarianism committee, have participated in sessions that have resulted in sectarian criminals evading legal punishment and imposing collective punishments on Egypt’s Christian minority. The state’s own sectarian laws and policies serve as a pretext for discrimination and vigilantism. Many violent sectarian incidents occur in contested cases of church construction, which is governed by discriminatory laws that are selectively applied. According to the aforementioned EIPR report, nearly a third of the cases of reconciliation sessions came when Christians either sought to pray in a building that was not formally registered as a church or sought to renovate or expand an existing church. In one notable instance, a church in Marinab, a village in Aswan, was burned to the ground by a mob angry about the height of the church steeple. Following the arson, the then-governor of Aswan, Mustafa al-Sayyid, went on state television blaming the church’s steeple for the tensions, effectively endorsing the attackers’ legal pretext for burning the church. This arson attack inspired Copts to protest, which ended with soldiers massacring dozens of protestors in front of the Maspero building. The challenges of sectarianism for smaller religious minorities in Egypt rarely garner much attention. Freedom of religion is only constitutionally guaranteed to the “heavenly”—i.e., Abrahamic—religions, leaving Bahá’ís, atheists, and others without legal protection. Baha’i have secured the right to have national identification cards, a longstanding concern, though they are identifiable with a dash in the “Religion” field, and are subject to discrimination and harassment. Shi’a Muslims have been arrested for “attempting to spread Shi’ism” and for blasphemy, while the state-backed religious establishment decries Sunni-Shi’a reconciliation efforts and warns against the spread of Shi’ism. Egypt’s nonreligious citizens are discriminated against by the state and by both Christian and Muslim clerics, and lack the protection of any organized community. For the state to seriously address sectarianism, any group tasked with this goal must include representatives of the communities who are the targets of sectarianism. The state must look at the challenge beyond the prism of terrorism, which—while brutal in the violence it has at times visited on Egypt’s minorities—is only one part of a much broader and systemic problem in Egyptian society. As the state represses anyone who criticizes the government and particularly the security forces, it is difficult to foresee any serious effort to reform the legal and social dynamics that contribute to Egypt’s sectarian challenges. So long as state officials participate in sessions that impose sectarian extralegal punishments with impunity while helping civilians who engage in sectarian violence to evade prosecution, a permissive environment will persist and violence against minorities will likely continue unabated. It should not be thought that the state is the sole reason that sectarianism persists as a problem or that it alone can solve the issue. Nonetheless, so long as the state both permits and participates in sectarianism, while denying civil society any space to critically challenge the state and call for necessary reforms progress on the other societal issues that contribute to sectarianism, it will be impossible for the government to meaningfully address the issue. Indeed, how can a government that is a root cause of sectarianism have any hope of eradicating the root causes by only talking to itself? Fundamentally, the reason minorities are not represented on the committee purportedly meant to end sectarianism against them is because this committee is not really about them. Like the reconciliation sessions that only serve to deny their rights in the name of achieving a superficial calm, this committee is meant to coordinate efforts to eradicate the noisy manifestations of sectarianism that garner global headlines; namely, terrorism. It will almost certainly do nothing to end the steady drumbeat of smaller, less noticed instances of violence and social and professional discrimination. For that to happen, the government would have to look at the problem from a myriad of angles, not merely as a problem to be solved by security forces, and include the victims of sectarianism as peers in the conversation.